Someone who reads this blog or is a friend of mine through Facebook and knows where I live did something so randomly kind and it means so much to me. You see, I talk quite a bit of my love for robin's egg blue vintage finds. 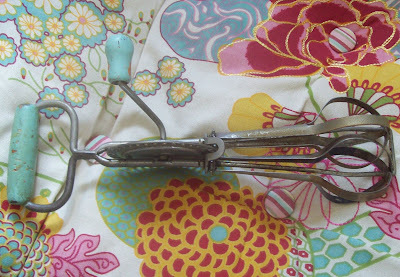 I recently bought a vintage pink egg beater on Etsy and mentioned on Facebook that I'd love to find one like it in robin's egg blue. And here it is. Thank you so much to the kind person who did this for me. I appreciate it. It is beautiful, as are you. I believe that people who randomly do kind things for others are beautiful souls and I thank you again to whoever you are.